This post introduces a take on the upcoming application group feature in Spring Cloud Data Flow / Spring Cloud Deployer, allowing multiple streams, tasks and standalone applications to be defined and deployed as an atomic unit. This feature is not implemented in the official Spring Cloud Data Flow or Spring Cloud Deployer projects. The application group feature discussed in this post is implemented as a custom external feature. This implementation of the application group feature is probably slightly different to what the official feature will end up being implemented as. For one, this implementation is realised in the Spring Cloud Data Flow project and not as part of the Spring Cloud Deployer project (the GitHub issue tracking the official feature is spring-cloud-deployer#99). This feature builds on the standalone application type discussed in this post with the proposal here. So what exactly is an Application Group? In the context of this custom feature, an Application Group is a container for multiple streams, tasks and standalone application types, that can be defined and deployed as an atomic unit. For example, an Application Group could represent all the streams, tasks and/or standalone definitions that logically belong or are related to each other and possibly could not function without each other. Conceptually equivalent to a JavaEE .ear file. --definition "stream: ticktock & stream: anotherstream"
where stream: ticktock represents the type of application (stream:) and the name of the application definition (ticktock). These apps must be registered as per usual Data Flow semantics and the definitions must exist prior to defining the application group. Multiple application types are supported by separating the references by the & symbol. In the example above, the Application Group would consist of two stream definitions. this would result in both ticktock and anotherstream streams being deployed as an atomic unit. An Application Group Descriptor project is simply a Maven project that contains a descriptor file called application-group.yml by convention. In combination with the Spring Cloud Data Flow Maven Plugin (see below), allows easy deployment of Application Groups via CI/CD tools etc. Application Group Descriptor projects make Spring Cloud Data Flow based implementations portable amongst teams. Much the same way Docker images allow for portable runtimes. # Each app listed will be imported as part of this application group. # Each stream listed below will be created and deployed. The Application Group Descriptor project is used in conjunction with the Spring Cloud Data Flow Maven plugin which applies the descriptor file to a Data Flow server. The Spring Cloud Data Flow plugin supports Application Group Descriptor projects and allows you to deploy the Application Group defined within to a Data Flow server instance. application-group-processor - which parses the descriptor file (application-group.yml) and expands shorthand URI references using Maven dependency resolution. This post will exclusively use this plugin to deploy the Application Group which is the subject of the demo application. DSL usage via the Shell is left as an exercise for the reader. a redeploy method added to Spring Cloud Deployer to redeploy applications that are already deployed. an update option added to stream, task and standalone application types. This allows existing definitions to be updated and optionally redeployed using the above redeploy feature. Both these features are crucial when using the Maven plugin to allow incremental development and testing of Data Flow based applications. As a way to walk through the new Application Group feature, we’ll develop a fairly contrived demo application consisting of multiple streams, a task and a standalone application. This demo application will perform the intricate task of converting times from one timezone to another. Other supporting stream definitions will also be created. The task will be implemented as a Spring Batch job that will ingest a file containing times (one per line) and convert them to a specified timezone, writing them to another file. The task will be triggered every 60 seconds via the out-of-the-box Trigger Task Source. We’d also like to be able to get notified when the task to convert times has started and when it’s completed. That’s why we’ll be deploying a standalone Spring Cloud Stream based web app that consumes from a channel where Spring Batch events will be emmitted by our task. Then we can stream those events to an HTTP client using a Server Side Events based Spring MVC endpoint. We’ll implement the requirements incrementally with the help of the Spring Cloud Data Flow Maven Plugin. The Maven plugin will allow us to register, define and deploy streams, tasks and standalone applications without having to leave our IDE or command line. The built in local deployer will be used for running our demo applications. Standing up a local server instance will be described below. Enough waffling, let’s get stuck into some code. validation of the structure of the descriptor file. where we add the Spring Cloud Data Flow Maven Plugin. The <deploymentProperties> configuration item is analogous to deployment properties you would define when deploying through the Shell or UI. Also, note the <goal>application-group-processor</goal> goal, which parses the application group descriptor. The descriptor file is the heart and soul of an Application Group Descriptor project and what the Spring Cloud Data Flow Maven Plugin parses and applies when invoking the /application-groups/definitions endpoint on a Spring Cloud Data Flow server. The sections in the descriptor relate directly to the commands you would execute when defining a stream using the shell or UI. Note however that the uri property is not the fully qualified Maven URI of maven://org.springframework.cloud.stream.app:time-source-kafka:1.0.4.RELEASE but rather, contains what is the artifactId in the pom.xml. I.e. time-source-kafka. It is the application-group-processor goal, mentioned briefly above, that expands the artifactId to the fully qualified URI property as the descriptor is parsed. It does this by looking at the dependencies section in the POM and expanding the URI based on the matching groupId and version. This has the benefit of enforcing that the apps being registered are resolvable artifacts. If you provide the fully qualified form of the URI the expansion will not be applied. This allows the descriptor to support other resource types like docker:// and file://. dataflow:>stream create --name timely-stream --definition "time-source | log-sink"
Now that we’ve got our Application Group defined in our descriptor project, it’s time to deploy it to a Local deployer based Spring Cloud Data Flow server instance. Before we can deploy our Application Group we need a binder instance to provide the messaging middleware. For this sample application we’ll use Kafka. Note that you have to enable the application group feature (--spring.cloud.dataflow.features.application-groups-enabled=true) as it’s disabled by default. Enabling the application-groups feature also implicitly enables the standalone-application feature. The plugin will use the default server URI of http://localhost:9393 and invoke the RESTful API of the Data Flow server. You’ll notice there is a new module called timezone-processor-kafka. All it does is take in the String representing the current time originating from the Time Source app and converts it to a configured (via an application property) timezone. Then the converted time, as a formatted String representation, is sent out on the default Processor.OUTPUT channel. There’s nothing much else to it, feel free to browse the code for more detail. Note that we register (using the shorthand method) the new timezone-processor processor app as before. We also added the new processor to the stream definition. Note that we provide the timezone we would like the input time to be converted to by specifying the --timezone=Africa/Johannesburg application property. Now, before we can deploy this updated Application Group, we must upgrade Kafka 😐. 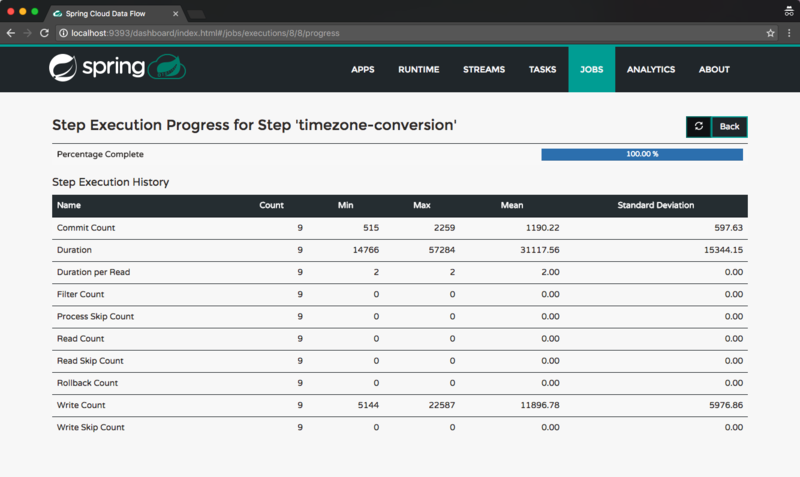 The current stream app starters (time-source and log-sink) at version 1.0.4.RELEASE (at time of writing), use the 1.0.3.RELEASE version of spring-cloud-starter-stream-kafka which includes the Kafka 0.8 client library. However, our timezone-processor uses the latest and greatest Brooklyn.SR1 Spring Cloud Stream release. 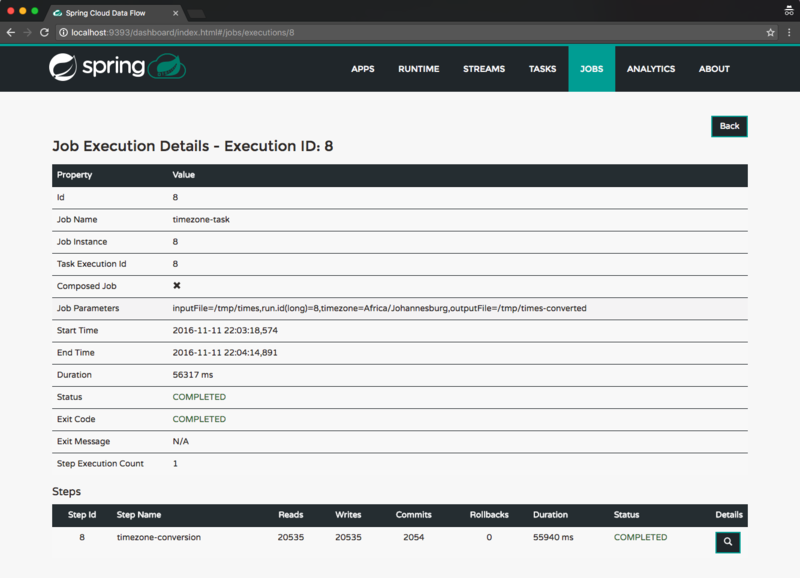 This release includes the 1.1.0.RELEASE version of spring-cloud-starter-stream-kafka which uses the Kafka 0.9 client library. 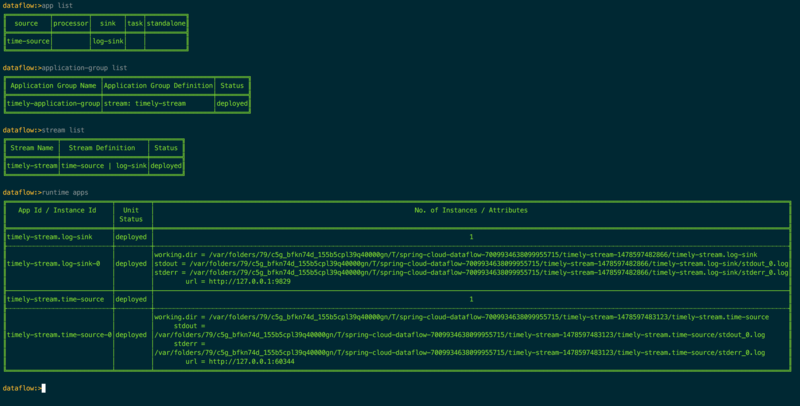 Problem is, the spotify/kafka Docker image we are using is a Kafka 0.8 instance. Therefore, the timezone-processor with the newer client library (0.9) will not work with this Kafka container (0.8). So upgrade we must! There are multiple PR’s currently open to upgrade the spotify/kafka image to the latest Kafka version but unfortunately none of them have been merged. So to make things easier I’ve built a Kafka 0.10.0.1 image based on PR #56 and pushed it to Docker Hub as donovanmuller/kafka:0.10.0.1. 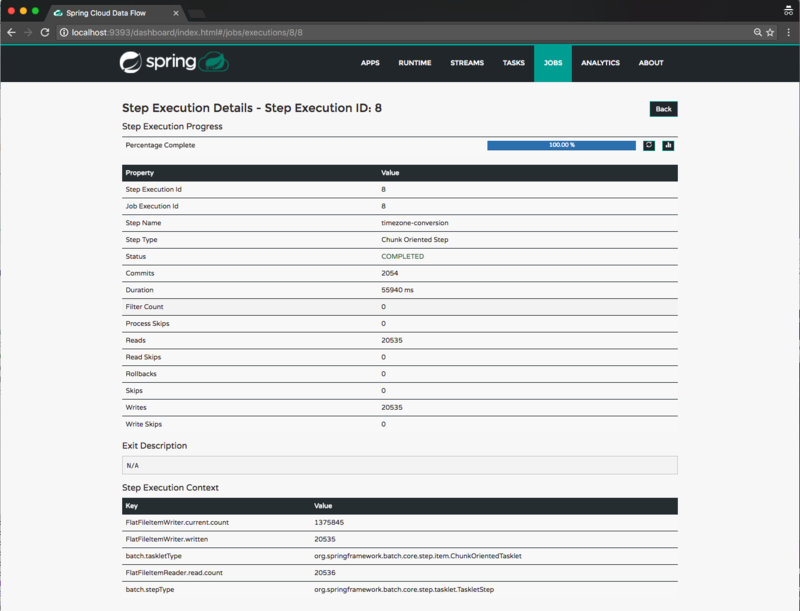 Now that our stream is fully implemented we need to finish off our demo application with a Spring Batch based Spring Cloud Task application. This task will read a file with a list of times (one per line) in the same format as our timely-stream, convert them using the same logic as our timezone-processor and finally write the converted times to a another file. Our timely-stream already emits times in the correct format, so it makes sense to use that stream as a source of times for our task. We can use the tap feature to write the converted times from the timezone-processor to a file using the out-of-the-box File Sink. we create a new stream definition with the tap’s name of timely-file-tap and the tap definition :timely-stream.timezone-processor > file-sink .... We send the tapped messages from the timezone-processor of the timely-stream stream, to the file-sink registered app (added in the apps section above as well as a <dependency> in the POM). The application properties added to file-sink tell the app to write all messages to the /tmp/times file and append any messages received to the same file. Deploy the all the taps! A few things to note before we dig into the task implementation. The logic to convert the times has been extracted into it’s own timezone-converter module, so we don’t have to duplicate the functionality in the batch job’s processor. This module will be auto configured by Spring when included as a dependency. and that’s about it really. @EnableTask will take care of the Spring Cloud Task related chores of recording the execution of the job and so forth, so nothing more to see here. Now we need a way of triggering our timely-task. We’ll do that using the out-of-the-box Trigger Task Source application. The Trigger Task app can send a TaskLaunchRequest message at predefined intervals or based on a cron expression. Given that our requirements were to trigger our task every 60 seconds, the interval based approach will work nicely. If you’re not familiar with Spring Cloud Task in the context of Data Flow, you might be wondering what consumes this TaskLaunchRequest message and how our task gets launched? Well, we need one more app to do that for us, the out-of-the-box Task Launcher Local Sink. This app consumes the TaskLaunchRequest message and launches the specified task locally, similar to how the Spring Cloud Deployer Local server launches apps. as before, we’ve added the trigger-task and tasklauncher-local apps to our POM as dependencies, which allows us to add them to the apps section using their shorthand URI’s. One final requirement and we’re done! When a Spring Cloud Task is executed it can emit events to a Spring Cloud Stream channel, what’s more, if the task is a Spring Batch based job, then Spring Batch related events can be emitted. Before we walk through the web app that will consume the task/batch events and the changes to the timely-task to emit those events, let’s add support for centralising not only the configuration of our apps but also our Data Flow server. 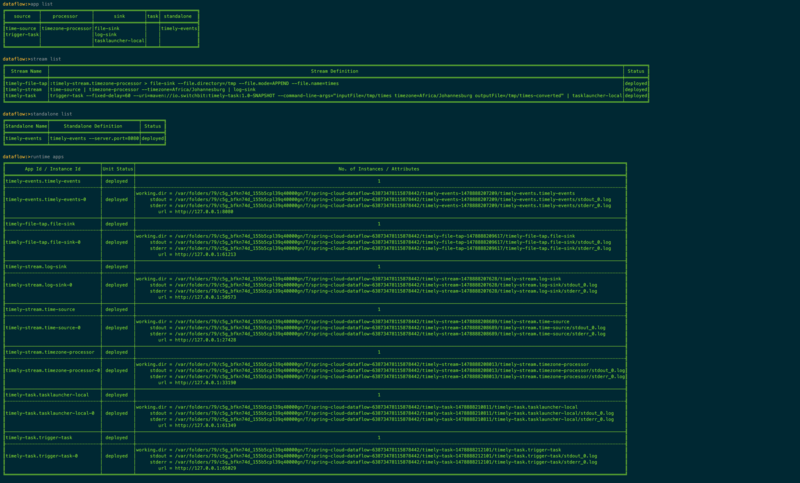 the config server will be running on http://localhost:8888, which is the default endpoint for config clients. nothing. Even though, as you are reading this, there are probably tasks being triggered and launched. So why don’t we see the executions? The task/batch executions can only be recorded if a persistent (not the default in-memory H2) datasource is configured. What’s more, it should be the same datasource as used by the Data Flow server. Note the username (POSTGRES_USER), password (POSTGRES_PASSWORD) and database (POSTGRES_DB) name match those of the datasource configuration above. when you stop your local server, all apps should be undeployed. Note that when we start the server again, we no longer need to add the --spring.cloud.dataflow.features.application-groups-enabled=true command line argument because this gets populated from the config server now. Redeploy all the things! Again! and as expected, all our streams and standalone application have been deployed successfully. we can now see that the task/job executions are recorded. 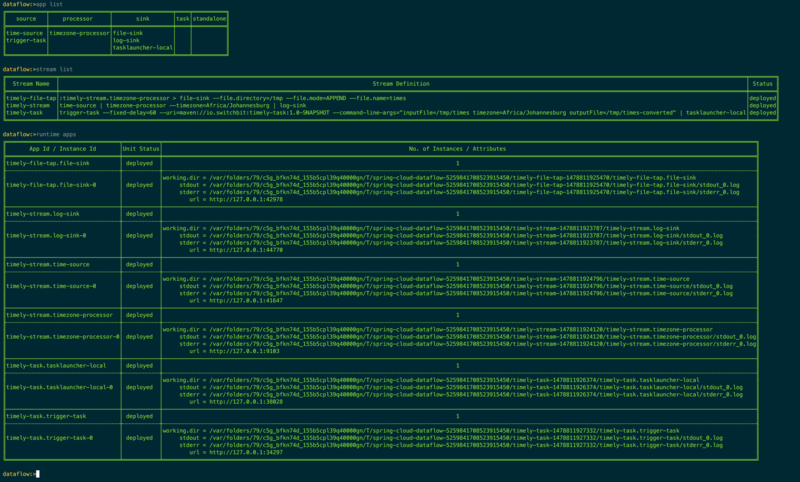 This is thanks to our Data Flow server and our timely-task using the Postgres container instance as a datasource. 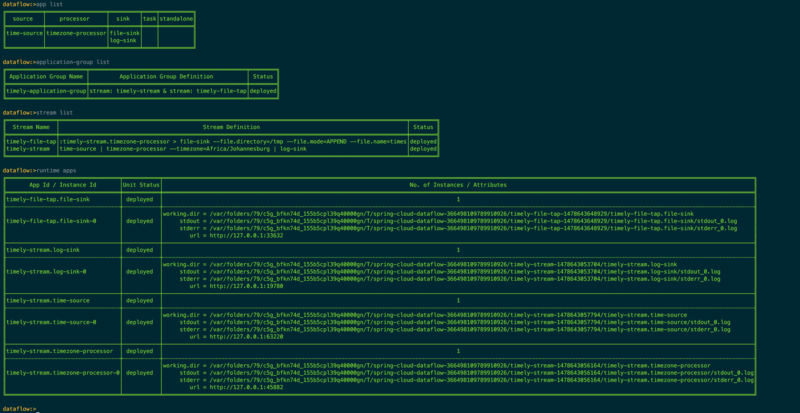 We haven’t mentioned the timely-task configuration of this datasource but that’s just because it’s configured exactly the same way as the Data Flow server, using the timely-application-group-configuration GitHub repository in the timely-task/application.yml file which will be served up by the config server. For the astute reader, you would have noticed that there was an extra application registered and deployed when we deployed the timely-event branch version of the Application Group descriptor. The application is a standalone Spring Cloud Stream web application that binds to the timely-events channel and broadcasts any events emitted by our timely-task job to any subscribed HTTP clients using Server Side Events. you’ll see the timely-events app registered and a new standalone section containing the definition of our timely-events standalone application (see this blog post introducing the standalone application type). this will connect to the /events/subscribe endpoint that will stream (connection will be closed after 60 seconds) the events emitted by our timely-task job as it executes. The Spring Batch events are normally emitted to a channel per listener, however, for simplicity, we configure the events to be sent to a single channel called timely-events. This channel becomes the input channel for the timely-events application. I.e. it receives all events emitted by the Spring Batch listeners. These events then get pushed to any connected clients via Server Side Events. The Application Group feature allowed us to incrementally add functionality from the most basic stream, all the way to multiple streams and a standalone application. All of this, without having to manually undeploy/destroy and define/deploy streams/standalone applications at any point. Nice. Hopefully this was a good demonstration of this take on the Application Group feature. Any feedback welcome!